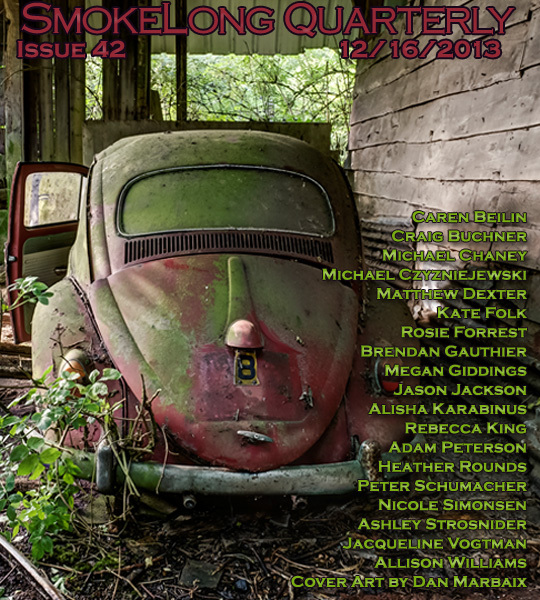 I was so pleased recently to have my flash, “As If a Bestiary Had Wings,” published in Issue 42 of SmokeLong Quarterly–the very best place for flash fiction in my opinion. One of the reasons for SmokeLong’s success is their rather unique editing model. Each week, a prominent flash writer serves as guest editor, selecting only one flash from the whole batch submitted that week for inclusion in the quarterly. The guest editor for that week then conducts an interview with the chosen writer, which also appears alongside the published piece. My flash was chosen by Helen McClory. Originally from Edinburgh, McClory was recently a Creative Futures Artist-in-residence at the Banff Centre, Alberta, Canada, a Writer-in-residence for the journal Necessary Fiction, a book reviewer for PANK, and a staff writer for The Female Gaze. Her novel Kilea won the Unbound Press Best Novel Award 2011 and she’s had work published in Sundog Lit, 3:AM Magazine, and Necessary Fiction. Here is the first question Helen asked me in her interview and part of my response. H.C. What drew me first to this work was the distinctive word choice, the vivid sense of texture and animal and chemical stink you built up—and rhythm, though that’s a separate point. I was wondering if you could just talk about your choices here. Take this as broadly as you like. M.C. Those keen sensory textures come from experience. Aesthetic choices had a lot to do with it, of course, but I would say that more than with most pieces I’ve written, this one pressed itself into textual existence out of the actual experience of attending the death of a family dog. That event seemed so clinical to me, so sad and so very clinical. I suppose I wanted to ritualize it, perhaps in compensation for the emotional sterility it left me with. I wanted to create a kind of ceremony through an ecstasy of perceptual—particularly olfactory—richness. Thanks for sharing and enjoy the poking of hot irons, may they lead to many a rich textured fire. Congratulations, Michael! It’s a great honor, and very well-deserved. I enjoyed reading this flash, and the drawing with it is very interesting. That’s a great publishing credit. Well done! I’m grateful to be published there–it’s one of my favorite journals.